The idea of the ideal home differs from person to person, but statistical analysis can determine the most popular and sought after elements that are desired by the majority. 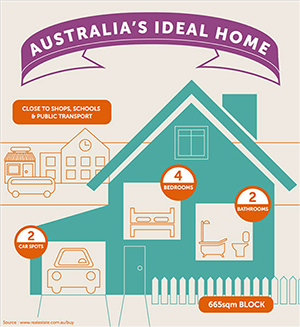 So what would the ideal home for Australians be like? How many bedrooms and bathrooms and car spaces would be perfect? Firstly, we start with the block of land the house is situated on. Six hundred and sixty five squared metres is considered the ideal allotment size. This allows for both a generous house and suitably sized yard. The location is another important element of idolised property. Ideally, being situated close to shops, schools and public transport. Four bedrooms and two bathrooms are the most popular configuration with space for two cars in the garage. How much are Australians willing to pay for the ideal property? The median listing price is $650,000. On average, buyers are willing to pay $100,000 more than the value of their current home to acquire their dream property. According to data from the Australian Bureau of Statistics the average Australian house has three bedrooms and occupies a 474 square metre block of land. These figures suggest most Australians are not completely satisfied with their current houses and most likely strive to upgrade eventually. ABS data shows 43.6% of Australian homeowners are dissatisfied with their homes because they are too small, while only 5% of households state that their homes are too large. Experts say the modern depiction of the ideal house reflects changes in contemporary living and social situations. While needs have not changed, wants certainty have. Zoning is becoming increasingly popular with multiple separated entertainment spaces prevalent. The likes of rumpus and theatre rooms as well as alfresco and dining areas are almost expected in modern homes. The aspiration to upgrade bodes well for the housing industry as new ideal homes are constructed and existing houses are renovated to meet the desires of Australians. The figures used to determine Australia’s ideal house are based on an analysis of more than 28,000 highly engaged listings on realestate.com.au between 3 Feb 2016 and 5 April 2016.